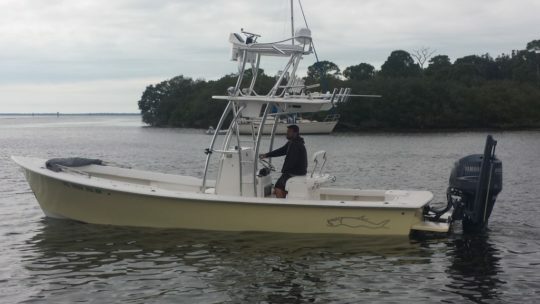 2006 Gause Built 26 – This 26 is very well maintained and has a 250 Yamaha with low hours that has been freshly service and inspected . This Gause Built 26 has the hardtop tower with tower springs , Birdsall tackle center leaning post . Other features include a new 8 ft Pro Power Pole , dive platforms with ladder and handle , Lenco trim and troll trolling motors ,NEW Stealth on-board charging system , fresh water wash down system , interior lighting package , Go Light spot light and Dodger top with front deck cushions set . The electronics include a 5212 Garmin at lower station and 4208 Garmin at upper station , Icom VHF radio and 6 speaker JL Audio stereo system with 2 10 inch subs .Taco Grand Slam outriggers with poles . The color is Fighting Lady Yellow and shines like new ! All of the cushions have been recovered for the new owner , also includes a full boat cover that covers the entire topside with the tower up and full window enclosure . This Gause Built 26 is at the shop and ready for a test ride . Please give us a call if you have any questions .